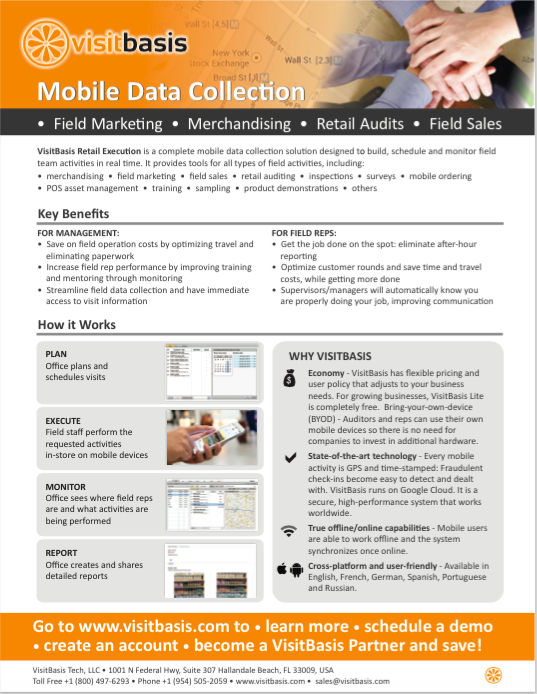 Looking for a perfect retail audit software solution for your company? Here are some things that can help you make the right choice. Implementing retail audit software for mobile devices allows companies to streamline retail data collection, get data faster, and gain insights on how to improve the bottom-line. Today there is a great variety of retail audit software solutions on the market for retail audits, merchandising, competitor analysis, field sales, and field marketing. No wonder that it’s hard to choose which type of software fits for your company better, so VisitBasis created this article to help you make the choice. Find the exact type of software you need, by answering the right questions. What pricing model is good your company? The first thing, you have to do, is to find fair and transparent pricing model suitable for your budget. 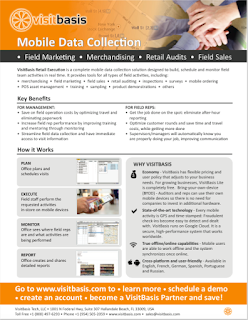 As for retail data collection, a long-time trend is a choice of SaaS solutions that can run common tablets and smartphones. Mobile devices are quickly becoming a huge part of retail space enabling companies to easily conduct in-house retail audits. In these conditions, managing a server for retail data collection needs is an outdated and resource-wasteful practice. When you implement a SaaS retail audit solution, you don’t need any additional resources to make it work – no servers, hardware, IT staff and so on. If you opt for a SaaS retail audit solution, look for those, which allow BYOD implementation – so you can also completely eliminate costs for field reps’ mobile devices. Which business processes are you going to automate? If you implement a comprehensive retail audit software solution, it can bring value to several departments within one company helping to cut the budget. For instance, an all-in-one retail audit software solution can be used to automate merchandising activities, perform customer surveys, manage POS materials, or even make product purchase orders from points of sale. Is the application easy to deploy and use? The important benefits of a SaaS retail audit solution is that it’s typically extremely easy to deploy. No installation needed, you get Web access to the application from anywhere. Cloud retail audit software allows you to easily operate your business worldwide and have 24/7 customer support. What are additional costs and benefits? The price for retail audit software can vary depending on the features you need. Choose software vendors that offer a free trial, so you can decide whether the app fits for your needs without upfront spending. It’s also reasonable to look for a scalable retail audit software solutions, which can grow with your business and won’t cost so much at an early stage. Take into account that many Cloud retail audit software vendors offer free data storage as a part of their service. How is your data going to be aggregated and shared? If you are going to work with big data Cloud implementation is a must. Cloud retail audit software provides 24/7 access to retail data worldwide and allows processing huge amounts of data very quickly, providing real-time data workflow. Take into consideration that the most advanced types of retail audit software provide sophisticated reporting and powerful analytic capabilities so you can get the precise data you need at the moment in a format you want it. Data sharing capabilities and integration with a third-party software are also important issues that should be considered. VisitBasis aims to help companies find the retail audit software solution that fits as well as possible. Therefore we developed several retail data collection software pricing models and offer many optional features to customers, which allow our retail audit software to stay one of the most competitive products on the market. Please, register at www.visitbasis.com for a free trial or book a free online demo to get answers to all questions.